His statement lingered as the five teammates around him — seniors Kurt Tobias, Travis Briggs, Skylar Sipe and Miguel Lozada and first-year graduate student Mike Zumpano — voiced their wholehearted agreement. 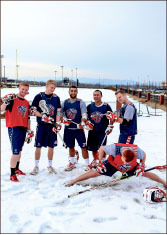 The Liberty University Men’s Lacrosse program has achieved unprecedented athletic success in its brief existence. As members of the team since its 2010 inception, they have experienced every bit of its four years, three seasons, one conference championship and a swift rise to Division I (DI) of the Men’s Collegiate Lacrosse Association (MCLA) firsthand. The six remaining originals, living parts of the program’s unique history value the milestones all the more. 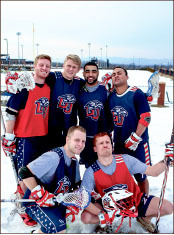 Liberty’s history with lacrosse precedes its instatement as an official club sport. A thriving student-run program existed on campus until 2005, when the team was involved in a horrific car crash that left half the roster with extensive injuries. The remaining players, including junior team captain and president Kyle McQuillan, managed to hold their shattered team together to complete the season. Afterwards, the program struggled along until it eventually dissolved and the players scattered. By the time the club sports department was created in 2007 with Director of Campus Recreation Kirk Handy at its head, McQuillan had taken a job with the school working in finance — lacrosse relegated to the past. Fast forward two years. Zumpano arrived as a prospective student on a campus visit, making a beeline for Handy’s office. The Connecticut native was introduced to the game of lacrosse his freshman year of high school. Four years later, determined that his college experience would include his favorite sport, Zumpano met with Handy to discuss the possibility of starting a lacrosse program from scratch. With a deadline by which to have players and a league organized, Zampano and a handful of others pieced together a roster — an unlikely group of athletes with a shared goal. They researched potential leagues in which to play and held practices. South campus was home to regular games, participants running the length of the recreation fields and shooting on a softball net. By spring of 2010, all club sports needed from the players to launch the program was a coach. After receiving a tip from those involved with the past team, Handy reached out to McQuillan and explained the situation. McQuillan was surprised, but jumped into the fray without a second thought. That, along with McQuillan’s administrative skills and knowledge of the South Eastern Lacrosse Conference (SELC) of the MCLA, was enough for Handy. Club sports hired McQuillan and announced the official start of a club team that fall, just in time for the arrival of freshmen Sipe, Tobias, Briggs, Haywood and Lozada. All five shared similar lacrosse histories, picking it up as an offseason sport at the urging of friends, coaches and, in Tobias’ case, an older sister who played the sport and lined her little brother up in goal for frequent target practice. Other than Tobias and Briggs, who attended rival high schools in Northern Virginia, none knew each other or Zumpano. Most had no idea of the team’s revival until the semester was already underway. 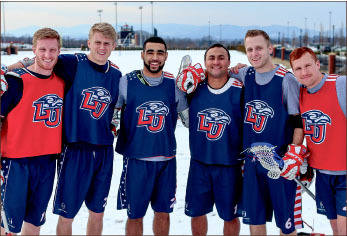 Through word of mouth, they learned that Liberty was bringing back lacrosse and showed up for tryouts. When the final roster was released, all six of their names were on it. Sipe said the team was forced to move around a lot that first year, and Lozada reminisced about a time they were forced to move near the softball field. With inconvenience and inexperience working against them, the Flames shifted their sights. The attitude check worked in their favor. The team went 4-4. “It was a big deal, considering we just kind of threw a team together and managed to win some games that we weren’t supposed to win,” Sipe said. More importantly, they ended the season with their greater goals intact. “When I look back at that first year, I think of it as being just as successful as the last two, because we established ourselves,” McQuillan said. Liberty further contributed to that stability with the construction of state-of-the-art facilities for the team. Without logistical mix-ups to worry about, the Flames could focus their attention fully on the field. They put up an 8-4 overall record in their second season, falling in the playoffs to eventual SELC champion Elon. Just one year later, it was Zumpano hoisting the SELC championship trophy in celebration with his teammates, McQuillan receiving a customary Gatorade dousing after sweeping the playoffs. Their 18-2 season only ended in a nail-biting, Final Four overtime loss to eventual MCLA Division II champion University of St. Thomas. It also made possible the realization of another dream McQuillan had harbored since his playing days — moving up to DI of the SELC. The team received official approval in 2013, and while the players are excited to step up, they are not daunted. After all, the six have lived every step of the rapid rise of Flames lacrosse — they see no reason the rate should slow now. The six share high expectation for this season and NCAA dreams for the future. From humble but passionate beginnings to an SELC championship, they are accustomed to the extraordinary. In their final season together, the six aim to finish what they started in historic fashion. I have followed and supported this team both from my home computer, to attending games (living five hours away) and following everything ever printed on Facebook without so much as a negative comment since its inception. However, after reading this article, I am angered and disappointed that three young men with hungry and faithful hearts for the game, were never mentioned in getting this sport off the ground with those already mentioned at Liberty. Now, I know that these three passion men are not attending the university at this time, however, their input and support and grunt work also helped put this team into the conference play last year. Everyone has a part, as all parts of the body work for the whole, and should not have been excluded. Those dedicated men are Jimmy Spearman, who left Liberty to go into the military to server his country, Mike Strapelli and Asa Keimig, who both graduated last year. Asa, who chose not to continue to play, even with one more year of eligibility, still supports the team through his internship because of his love of the game. These men should not be forgotten when writing about the legacy of the game at Liberty University. They worked hard and fought hard for this game to be on campus as Champions of Christ through this sport through the good and the bad and the thick and thin and the wins and the loses and yes, even heart aches and heart breaks. And, yes, I am the mom of one of these men, and I am sure that I speak for the others parents. So I am guessing you can see where my anger and disappointment stems from. Please know that I am not expecting anything to be rewritten for Asa will probably give me a tongue lashing if he knows that I have written this, but this isn’t just about Asa, but about Jimmy and Mike who again, supported, worked hard, played hard and honored God through this sport. Thank you for listening, have a most blessed day and know that I will continue to support this lacrosse program through Facebook, the computer and will follow the team’s progress this season. I am hoping to make it to Lynchburg to watch the team play even though my son does not play anymore.